My love for the Beatles goes back for as long as I can remember. I remember singing songs with my mom and flipping through all of my dad’s records as a child. We sang Beatles songs in our school chorus, and I had posters all over my wall by junior high. In high school, I pored over their lyrics and read them like poetry. As a young adult, I heard a Beatles song being played in the first UU congregation I stepped foot in, and I chose Beatles songs to be played in my wedding. I cannot remember a time in my life that was not influenced by the music of the Beatles. As a young parent, I introduced my children to the Beatles on the very days they were born. Haelie was wrapped in a blanket designed by drawings John Lennon had sketched for his own son, and she could identify each of the Fab Four by name before she turned two. 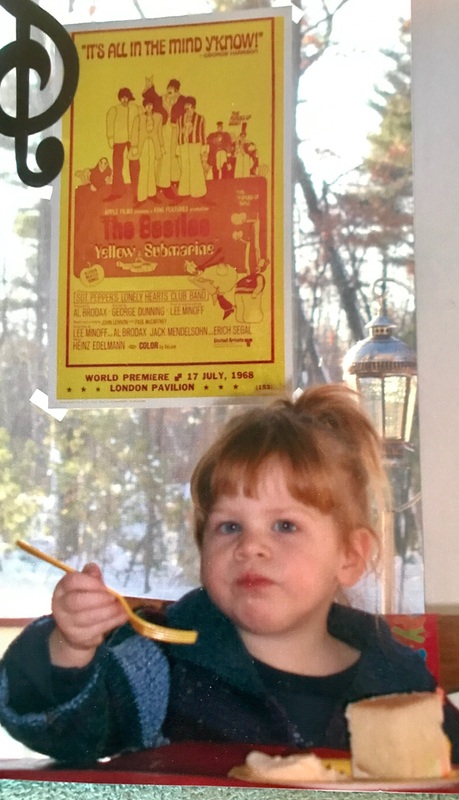 Her yellow submarine birthday party was a big hit for people of all ages. 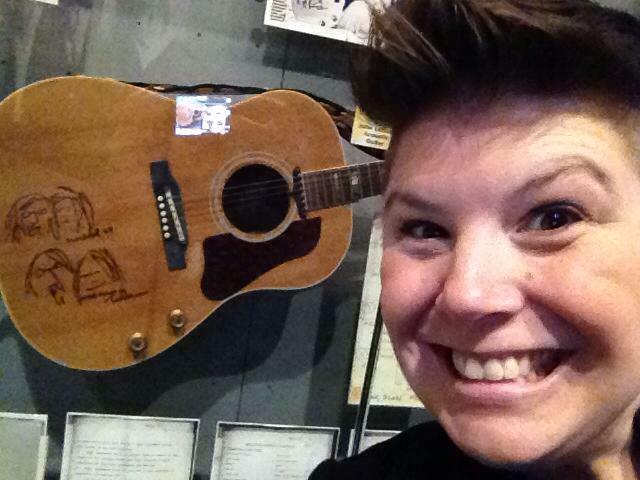 Abby may have been named after a certain album, and the framed album cover would hang in her room. She would often fall asleep to soft acoustic versions of Beatles songs, and would look at children’s books about these musicians. The drive to church on Sunday mornings would be timed perfectly with the Beatles Brunch radio show. My children cannot remember a time in their lives when the influence of the Beatles was not present. I just recently attended an international interfaith conference focused on bringing the generations together in church. One particular workshop was focused on our youngest members, those under the age of three. It was suggested that early childhood ministry is the most important ministry of the church that nobody is talking about. I was reminded of things I had learned in my child development classes in graduate school. I knew that children would learn more in their first six years of life than they would in all the years to follow. Take language for example. Most of our children will learn to understand and use the language(s) they are exposed to before they ever attend school. In their first four years, the average child will learn up to 45 million words. How many of these words are from the language of our faith? What would happen if as a congregation, we raised our infants and toddlers to be in worship with us every Sunday, where they were routinely exposed to that language? What if as a congregation, we developed religious literacy right from the start so that our children never remembered a time when they were not influenced or a part of our community of faith? I listened to my interfaith colleagues share stories of how they welcomed and ministered to the youngest among them. I heard about the congregation who hired a nursery care provider to sit and interact with the toddlers in worship each Sunday, in a designated space in the front of the sanctuary, replete with quiet activities that were connected to the theme of the service. I heard story after story of what it has meant to have babies, toddlers, and small children not only in worship, but in small group ministry, fellowship, and learning as well. I’ve been attending these interfaith gatherings for nearly a decade now. We have had so many similar challenges and goals in bringing our generations together more fully in congregational life. But this year, for the first time, I wept. I wept because ten years later, our interfaith colleagues had made marked progress where ours had been minimal at best. I wept because when I shared that our norm was to have our youngest in the nursery, while our school aged children were with us for 10-15 minutes of worship each week, our interfaith partners could not disguise their looks of absolute disbelief. Our children will absorb and learn from their environment and experiences. My home has two generations of women who cannot remember a time when the Beatles did not provide the soundtrack of their lives. As we consider the future of faith formation, and the future of Unitarian Universalism, I pray that the next two generations will not be able to remember a time in their lives that did not include the music and words of our faith, the scent of flickering candles, the embrace of community, and the experience of being known and loved. 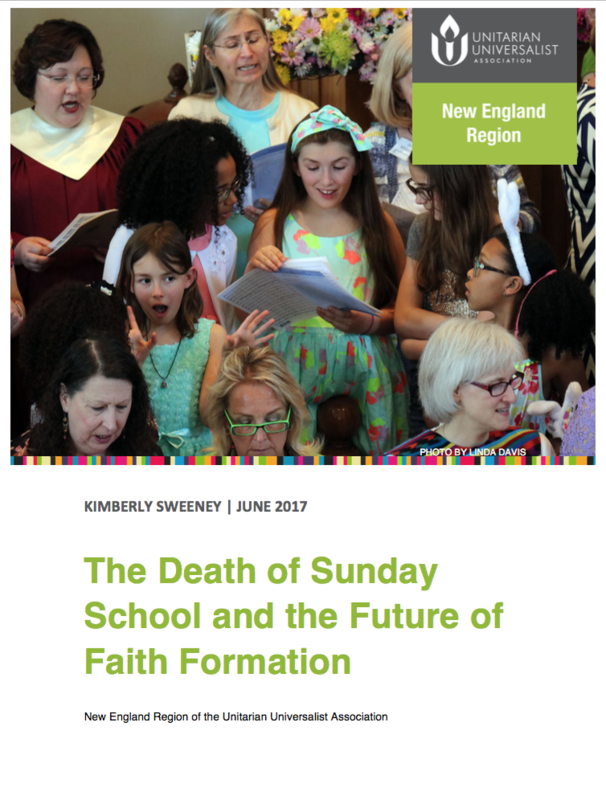 Kimberly Sweeney serves the New England region of our UUA as the lead for Faith Formation and Safe Congregations. She is the author of The Death of Sunday School and the Future of Faith Formation. Kim and her daughters share a home with Lucy the Chihuahua, Eleanor Rigby the Siamese cat, and Finnegan the world’s most loyal dog whose name bears no Beatles related significance. Anna is an Outreach Associate at the Unitarian Universalist Association. She's a practical systems thinker who also revels in exploring the woo woo. With a background in social work, entrepreneurship, and religious education, Anna melds compassion with innovation. She believes strongly that UUism is the future of faith: a natural evolution of humanity's inquisitiveness about the nature of existence and meaning.